After playing the biggest shows of their career this year, the sibling garage-blues duo of Eva and Cedric Walker punctuate 2018 at the Showbox, opening Thunderpussy's sold-out New Year's Eve show. Start swapping band names with any local rock nerd who’s left the house in the past two years and inevitably the Black Tones will come up. While the potent garage-blues duo has been winning over local clubs for several years, 2018 saw the band’s profile rise on the strength of the biggest shows of their career — including standout performances at the Capitol Hill Block Party, KEXP’s Concerts at the Mural and a slot opening for Death Cab for Cutie at the Paramount Theatre’s 90th-anniversary bash. The subsequent word-of-mouth bump has cemented the sister-brother combo as bona fide Seattle favorites, with a debut album expected in March that could keep their stock rising. 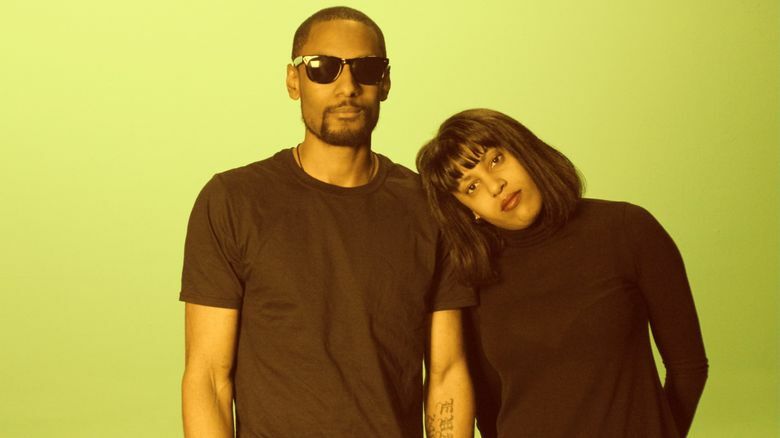 The band, comprised of Eva and Cedric Walker, wraps up its breakout year at a sold-out Showbox, opening for Thunderpussy and Portland stoner rockers Red Fang on New Year’s Eve. Eva and her twin brother (though you wouldn’t know it if not for matching grins) have come a long way since Eva used to sneak off to open-mic nights without telling her family. The first time Cedric and the rest of the family saw Eva perform was at the 2011 Northwest Folklife Festival. Eva’s solo set “almost brought me to tears,” says Cedric, who was so touched by his sister’s talent that he learned to play drums with Eva’s help. “He said he cried,” Eva affectionately goads, sitting next to her brother at a Columbia City bar and cafe. “I wasn’t, like, bawling,” Cedric counters. However misty-eyed he was, Cedric’s commitment to helping her with her dream resonated with Eva. “From then until now, if there’s an ideal band, I want my best friend in it with me, my twin brother — a person that I can argue with and we don’t fall apart,” she says. Eventually, the two started jamming together in their grandmother’s basement, with Eva’s songs finally getting the full-band sound she envisioned. The Black Tones, which these days performs live as a trio with hired bassists, marry swampy blues-rock with brawny and psych-laced guitars — a style Eva once described as a combination of “Cobain and Cornbread” during a Bellingham show. The tagline — also the title of their forthcoming album, recorded mostly with Jack Endino — alludes to the Seattle-reared siblings’ Northwest rock influences and their family’s Southern roots. Beyond those Southern-steeped blues rhythms, Eva counts two of Seattle’s finest — Jimi Hendrix and Jimmy James of the True Loves and Delvon Lamarr Organ Trio — as her primary guitar heroes. It’s not hard to hear a little Hendrix in her wavy, wah-wah-drenched solos and lessons she’s gleaned from all the nights listening to James — even staking him out at shows. “He would see me in the audience and he would turn his back, because I would film his hands,” she says, laughing. One of the main riffs to “The Key of Black (They Want Us Dead)” — a blunt protest song Eva says isn’t anti-police but decries racists hiding in uniform — was actually lifted from a James solo. The call-and-response anthem has become a staple of their live sets, with Eva and Cedric often joined by their mother and sister on stage to handle backing vocals. The tradition started with a gig at the Crocodile — at the time the biggest stage they had played — and continues whenever the band has an important show (or anytime Mom feels like gracing a stage). “We’re big family people, so any major thing that happens we want to have our family part of it,” Eva says. Naturally, when the Black Tones landed the show at the Paramount — a theater roughly five times larger than the Crocodile — it turned into a family affair. Also in attendance was their father, who Eva often describes on stage (much to her mother’s chagrin) as a real-life bank robber who went to prison when they were 2 years old. In punk-charged bruiser “Welcome Mr. Pink” — a live favorite — Eva imagines what her father was going through while incarcerated for roughly a decade. Neither Eva nor Cedric harbor a grudge against their father, who now regularly catches their shows. “We took our first family photo with my dad in it when we were at the Paramount afterward. It was like the best day of my life,” Eva says without hyperbole. After a big 2018, which also saw Eva named host of KEXP’s local show Audioasis, the sibling rockers hope even bigger things are on the horizon. But whatever the future holds for the Black Tones, Eva and Cedric have enjoyed every milestone along the way together. Thunderpussy, Red Fang and the Black Tones. 9 p.m. Monday, Dec. 31, Showbox, 1426 First Ave., Seattle; sold out, showboxpresents.com.